Meet the detectors of Fermilab’s Short-Baseline Neutrino Program, hunting for signs of a possible fourth type of neutrino. Neutrinos are not a sociable bunch. Every second, trillions upon trillions of the tiny particles shoot down to Earth from space, but the vast majority don’t stop in to pay a visit—they continue on their journey, almost completely unaffected by any matter they come across. Their reluctance to hang around is what makes it such a challenge to study them. But the Short-Baseline Neutrino (SBN) Program at the US Department of Energy’s Fermilab is doing just that: further unraveling the mysteries of neutrinos with three vast detectors filled with ultrapure liquid argon. Argon is an inert substance normally found in the air around us—and, once isolated, an excellent medium for studying neutrinos. A neutrino colliding with an argon nucleus leaves behind a signature track and a spray of new particles such as electrons or photons, which can be picked up inside a detector. SBN uses three detectors along a straight line in the path of a specially designed neutrino source called the Booster Neutrino Beamline (BNB) at Fermilab. Scientists calculated the exact positions that would yield the most interesting and useful results from the experiment. The detectors study a property of neutrinos that scientists have known about for a while but do not have a complete grasp on: oscillations, the innate ability of neutrinos to change their form as they travel. Neutrinos come in three known types, or “flavors”: electron, muon and tau. But oscillations mean each of those types is interchangeable with the others, so a neutrino that begins life as a muon neutrino can naturally transform into an electron neutrino by the end of its journey. Some experiments, however, have come up with intriguing results that suggest there could be a fourth type of neutrino that interacts even less than the three types that have already been documented. An experiment at Los Alamos National Laboratory in 1995 showed the first evidence that a fourth neutrino might exist. It was dubbed the “sterile” neutrino because it appears to be unaffected by anything other than gravity. In 2007, MiniBooNE, a previous experiment at Fermilab, showed possible hints of its existence, too, but neither experiment was powerful enough to say if their results definitively demonstrated the existence of a new type of neutrino. That’s why it’s crucial to have these three, more powerful detectors. Carefully comparing the findings from all three detectors should allow the best measurement yet of whether a sterile neutrino is lurking out of sight. And finding the sterile neutrino would be evidence of new, intriguing physics—something that doesn’t fit our current picture of the world. These three detectors are international endeavors, funded in part by DOE’s Office of Science, the National Science Foundation, the Science and Technology Facilities Council in the UK, CERN, the National Institute for Nuclear Physics (INFN) in Italy, the Swiss National Science Foundation and others. Each helps further develop the technologies, training and expertise needed to design, build and operate another experiment that has been under construction since July: the Deep Underground Neutrino Experiment (DUNE). This international mega-scientific collaboration hosted by Fermilab will send neutrinos 800 miles from Illinois to the massive DUNE detectors, which will be installed a mile underground at the Sanford Underground Research Facility in South Dakota. Closest to the BNB source at just 110 meters, the Short-Baseline Near Detector (SBND) provides a benchmark for the whole experiment, studying the neutrinos just after they leave the source and before they have a chance to oscillate between flavors. Almost a cube shape, the detecting part of the SBND is four meters tall and wide, five meters long and weighs around 260 tons in total—with a 112-ton active liquid argon volume. 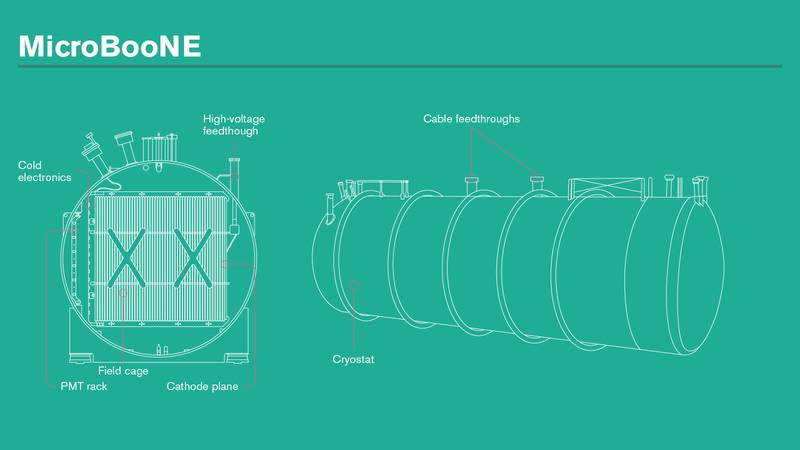 With a CERN-designed state-of-the-art membrane design for its cooling cryostat—which keeps the argon in a liquid state—SBND is a pioneering detector in the field of neutrino research. It will test new technologies and techniques that will be used in later neutrino projects such as DUNE. 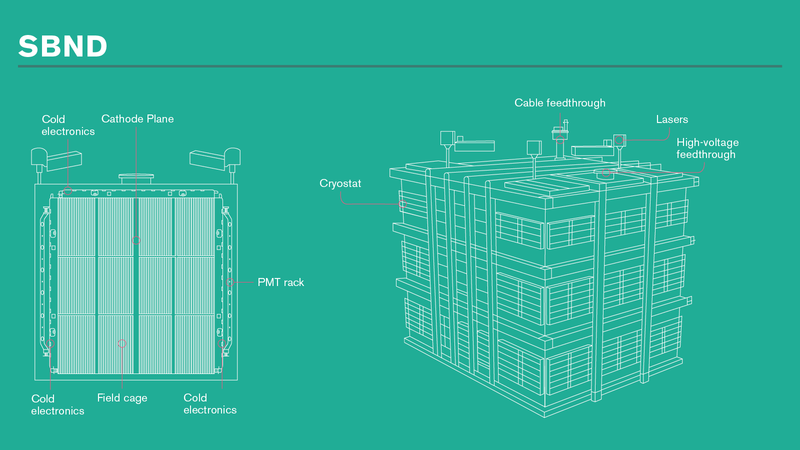 Due to its proximity to the neutrino source, SBND will collect a colossal amount of interaction data. A secondary, long-term goal of SBND will be to work through this cache to precisely study the physics of these neutrino interactions and even to search for other signs of new physics. The SBND is well on its way to completion; its groundbreaking took place in April 2016 and its components are being built in Switzerland, the UK, Italy and at CERN. The middle detector, MicroBooNE, was the first of the three detectors to come online. When it did so in 2015, it was the first detector ever to collect data on neutrino interactions in argon at the energies provided by the BNB. The detector sits 360 meters past SBND, nestled as close as possible to its predecessor, MiniBooNE. This proximity is on purpose: MicroBooNE, a more advanced detector, is designed to get a better look at the intriguing results from MiniBooNE. In all, MicroBooNE weighs 170 tons (with an active liquid argon volume of 89 tons), making it currently the largest operating neutrino detector in the United States of its kind—a Liquid Argon Time Projection Chamber (LArTPC). That title will transfer to the far detector, ICARUS (see below), upon its installation in 2018. While following up on MiniBooNE’s anomaly, MicroBooNE has another important job: providing scientists at Fermilab with useful experience of operating a liquid argon detector, which contributes to the development of new technology for the next generation of experiments. Techniques used to fill MicroBooNE with argon will pave the way for the gargantuan DUNE far detector in the future, which will hold more than 400 times as much liquid argon as MicroBooNE. Neutrino detectors rely on the liquid inside being extremely pure, and to achieve this goal, all the air normally has to be pumped out before liquid is put in. But MicroBooNE scientists used a different technique: They pumped argon gas into the detector—which pushed all the air out—and then cooled until it condensed into liquid. This new approach will eliminate the need to evacuate the air from DUNE’s six-story-tall detectors. Along with contributing to the next generation of detectors, MicroBooNE also contributes to training the next generation of neutrino scientists from around the world. Over half of the collaboration in charge of running MicroBooNE are students and postdocs who bring innovative ideas for analyzing its data. The largest of SBN’s detectors, ICARUS, is also the most distant from the neutrino source—600 meters down the line. 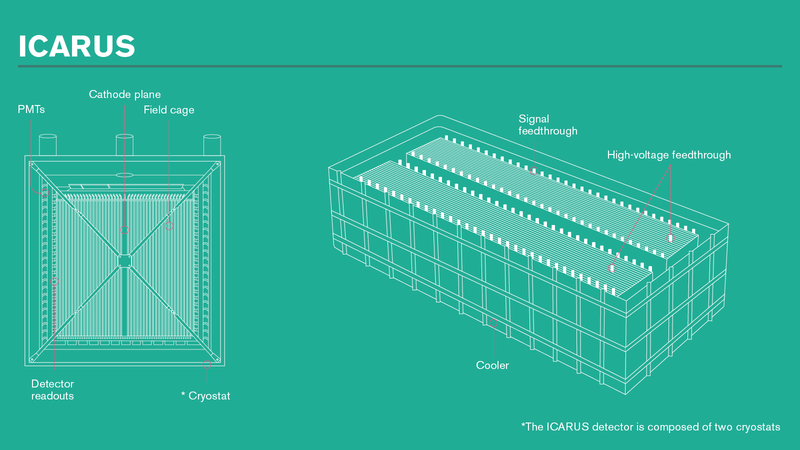 Like SBND and MicroBooNE, ICARUS uses liquid argon as a neutrino detection technique, with over 700 tons of the dense liquid split between two symmetrical modules. These colossal tanks of liquid argon, together with excellent imaging capabilities, will allow extremely sensitive detections of neutrino interactions when the detector comes online at Fermilab in 2018. The positioning of ICARUS along the neutrino beamline is crucial to its mission. The detector will measure the proportion of both electron and muon neutrinos that collide with argon nuclei as the intense beam of neutrinos passes through it. By comparing this data with that from SBND, scientists will be able to see if the results match with those from previous experiments and explore whether they could be explained by the existence of a sterile neutrino. ICARUS, along with MicroBooNE, is also positioned on the Fermilab site close to another neutrino beam, called Neutrinos at the Main Injector (NuMI), which provides neutrinos for the existing experiments at Fermilab and in Minnesota. Unlike the main BNB beam, the NuMI beam will hit ICARUS at an angle through the detector. The goal will be to measure neutrino cross-sections—a measure of their interaction likelihood—rather than their oscillations. The energy of the NuMI beam is similar to that which will be used for DUNE, so ICARUS will provide excellent knowledge and experience to work out the kinks for the huge experiment. The detector’s journey has been a long one. From its groundbreaking development, construction and operation in Italy at INFN’s Gran Sasso Laboratory under the leadership of Nobel laureate Carlo Rubbia, ICARUS traveled to CERN in Switzerland in 2014 for some renovation and upgrades. Equipped with new observing capabilities, it was then shipped across the Atlantic to Fermilab in 2017, where it is currently being installed in its future home. Scientists intend to begin taking data with ICARUS in 2018. Designed and built in the INFN lab in Pavia, Italy, from the late 1990s, then transferred to the INFN Underground Laboratory at Gran Sasso Laboratory, Italy, where it began operating in 2010. Traveled to CERN for refurbishment in 2014. Arrived at Fermilab in July 2017; currently under installation. Aims to start taking data in 2018.